I like Closer a bit more than I probably should. Not that there’s any problem with liking the film or anything, but I happen to think it’s maaaybe not worth it’s 8.5 score. It’s teetering on the cusp, but this scene puts it over the edge into Grilled Seal of Approval territory. What a great scene! 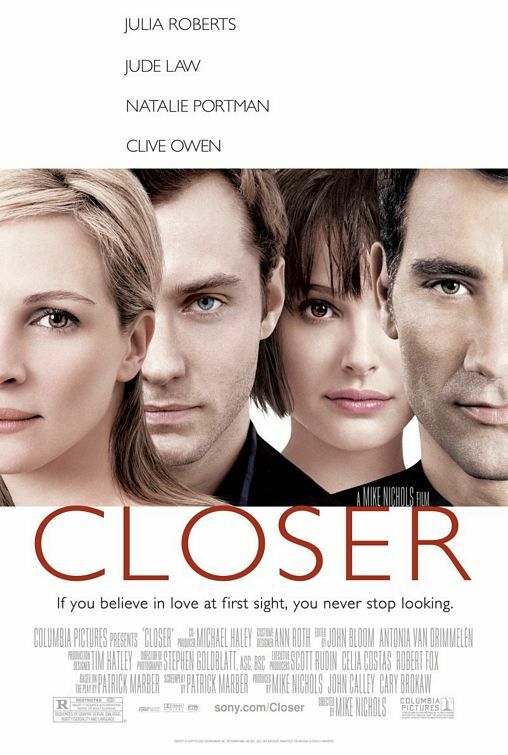 I watched Closer for the second time because I had been looking for Anti-Valentine’s Day movies or The 10 Movies Not to Watch on Valentine’s Day. Closer, with its near-continuous stream of lies and infidelity, certainly fits the bill. The Ten Movies Not to Watch on Valentine’s Day. That could be interpreted in a variety of ways, but I chose to focus on pleasant things like infidelity, murder, and pedophilia. I have not yet received edits on my article, so I don’t know if the movies with the more *ehem* disturbing topics *ehem* will be thrown out. We shall see. I have never unfaithful to a partner. No, it’s much more common to withdraw from a relationship slowly and painfully when I realize I am unhappy. Days or months or even years may pass before the final strands between my partner and I are cut and burnt and discarded. It certainly would save us both a lot of trouble if I committed an infidelity or two, but I don’t think I can do it. I can compare it to something my chef friend told me years and years ago when we both worked in the same restaurant. No matter how aggravated he felt because a customer sent back a plate or complained about the food, he would never, ever, ever commit some act of aggression on the customer’s food. I.E. – he isn’t going to be the chef who spits in food or intentionally drops a steak on the floor or pees in the eggs; he isn’t going to be cruel because he is in a bad mood. The only reason why this is noteworthy is because of this person’s character – he actually was the kind of person you would expect to spit in your food in you made him mad! He was temperamental, childish, and easily prone to fits of aggression, but at the same time he understood a very important food concept. He would never intentionally disturb a person’s meal because then he would always imagine he would attract the same negative attention. He could never spit in a person’s meal because then he would be too anxious to eat a meal in a restaurant: the constant checks under the burger for signs of spit, the continuous glances toward the kitchen to check on the back room activities, and the perpetual state of unease. Of course, I have a better reason for not cheating on a spouse/loved one/sexual partner than a simple fear of a hypothetical partner in the future cheating on me. I just don’t want to. I’m just not interested. If I don’t want to be in a relationship with someone, I will begin to initiate the break-up process. I am more referring to my relationships in yesteryears, because I have now (I think) learned how to speed up the break-up process so we both aren’t hanging onto something that should have been discarded long, long ago. Sure, I am better educated in the ways of relationships and women with every passing day, but the question remains if I will be able to coldly and succinctly extract myself when/if the time comes. Though practice makes perfect, right?